Our Concordia 1.50 Carat Cushion Cut Cubic Zirconia Princess Cut and Round Band Ring features a 7mm 104 facet cushion cut square diamond look cubic zirconia. 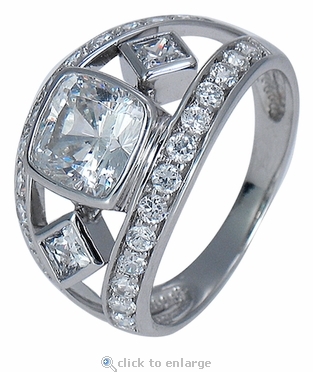 The Concordia Ring is a unique and stunning ring that can be worn as an engagement ring or as a right hand ring. A 1.50 carat bezel set cushion cut square and two .50 carat 4mm bezel set princess cut squares are centered between the split shank band. 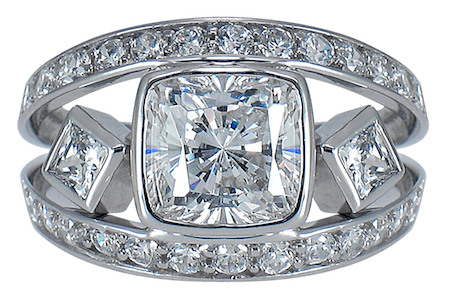 The two bezel set princess cut cubic zirconia stones are attached to the sides of the cushion cut center providing a more substantial diamond look but also maintain an open feel to the ring. The shank on this ring measures 12.5mm at the top widest point and is accentuated by a row of pave set rounds that line halfway down both sides of the band. 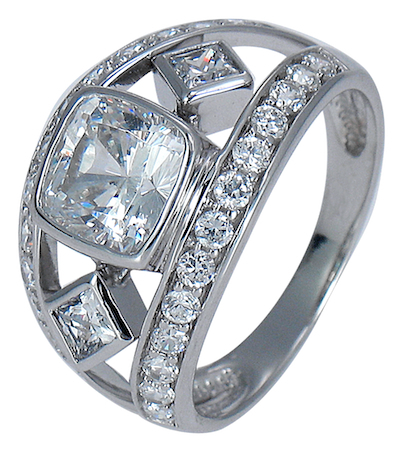 The total carat weight is approximately 3.25 carats of the finest lab created diamond simulants.